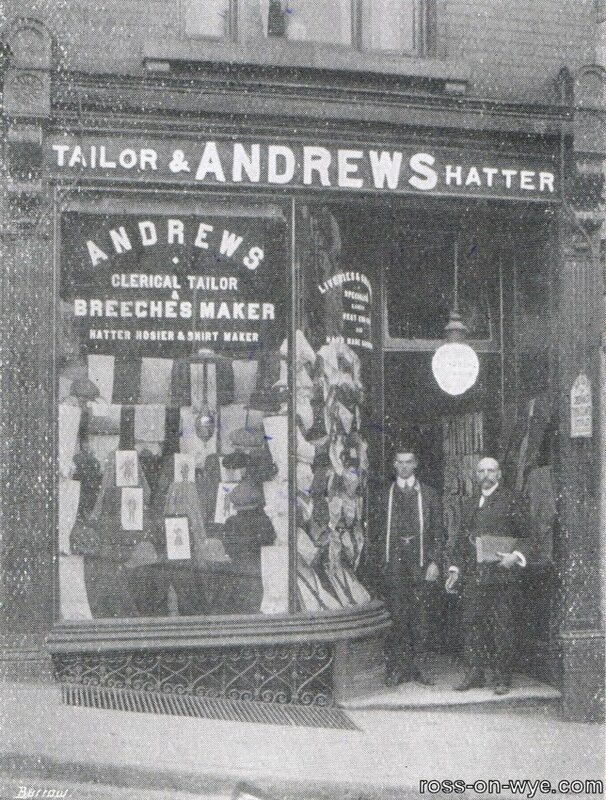 Clerical Tailor and Breeches Maker, Hatter, Hosier, Glover and Shirt Maker. Large stock to select from. Low Prices consistent with highest qualities. 5 per cent discount for cash. 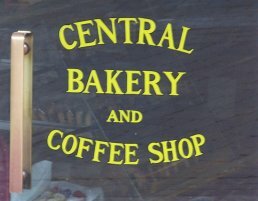 The Central Bakery was one of the oldest family firms in Ross, was one of the founder members of Family Loaf Bakers, Avonmouth, and their premises occupied a prominent site in the Market Place which is a prime retail position in Ross. 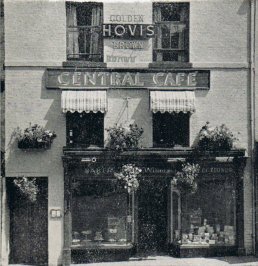 Mr. Thomas Williams founded the Williams Central Bakery (Ross) Ltd. in 1921 when he acquired the business from Mr. A. E. Baldwin who was a Pastry Cook and Confectioner, baker and flour dealer and the shop was a tea rooms. 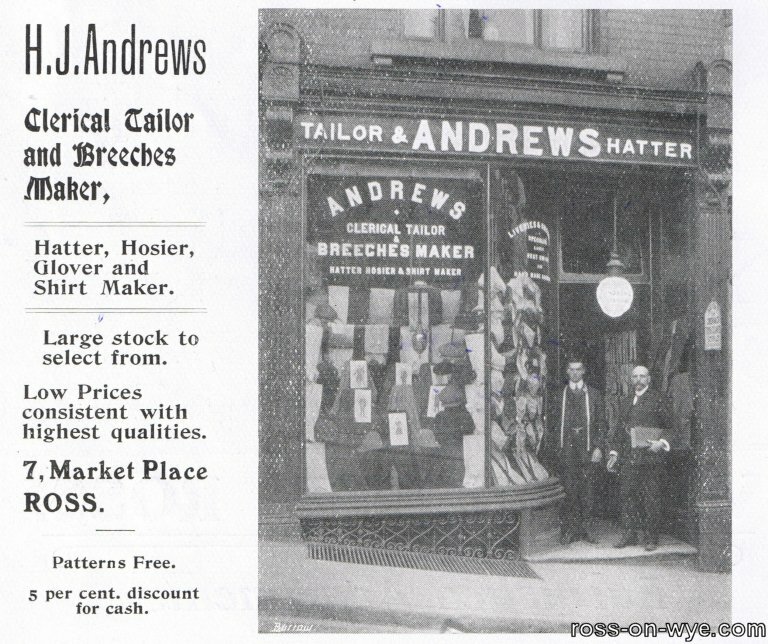 Thomas brought with him his horse and van that he had been using for deliveries from the general stores and post office that he had set up at Kingsthorne; the deliveries then became speedier with the introduction of motor vans. The first floor of the building, before it was converted into offices, was before and after the war quite a social centre, being a popular place for dinners, whist drives and meetings. 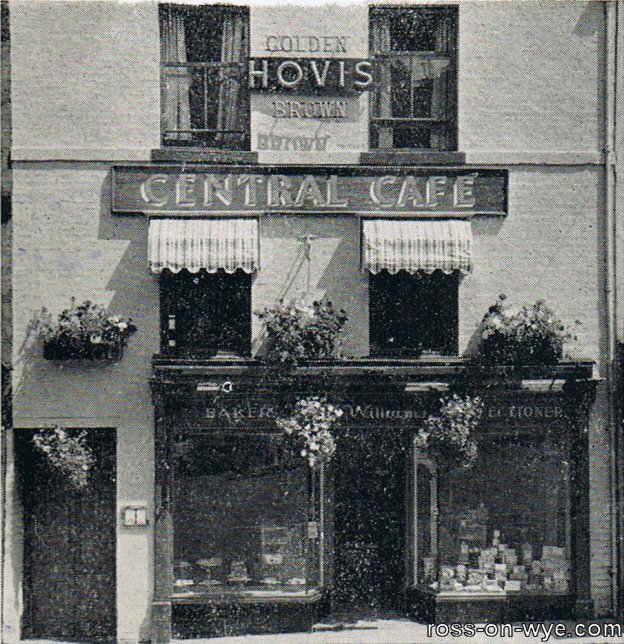 His sons, Central Bakery directors, Trevor and Geoffrey Williams, recalled that in the days following the evacuation from Dunkirk a large number of troops were stationed in Ross and 270 meals were served four times a day to these troops and afterwards, the upstairs cafe became an officers' mess. 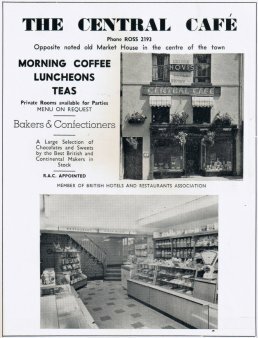 At its peak the business had 40 employees with four vans serving Mr. Stan Little's bakery, Brookend Street, which they had taken over and a shop in St. Owen's Street, Hereford. Besides the wholesale business they were making 1,000 retail deliveries. His son, Mr. Geoffrey Williams, then took over the business and then his son, Mr. Michael Williams, joined the board of directors in 1986 at the age of 21 to become the third generation running the business3. Michael trained at North Gloucestershire College of Arts and Technology after leaving Wycliffe College, Stonehouse. He took over the day to day running of the bakery and the management of around 20 employees in January 1986. 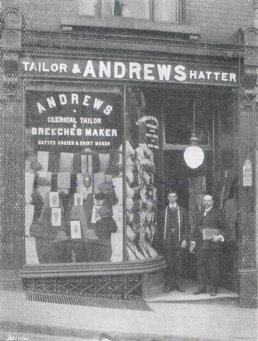 His father, Geoffrey, took over as the chairman of the business when his brother Mr. Trevor Williams (Michael's uncle) relinquished the chairmanship. Trevor remained as a director and also lent a hand in the bakery when needed along with Michael's aunts, Frances and Jean. Each day the business turns out more than 100 kinds of cakes, buns and rolls, along with speciality celebration cakes. Since I joined the firm, I have introduced a number of new lines including the Herefordshire lardie, apple and cherry strudels and lemon doughnuts. I am now developing some new recipe ideas, one of which has strong local history connections. In March 1991 the business was taken over by a nationwide concern, Rank, Hovis and McDougall. 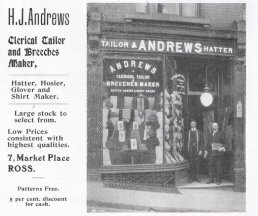 They had, in 1991, 200 shops in the UK in an area stretching from Middlesborough to Plymouth and now Ross to Dover. 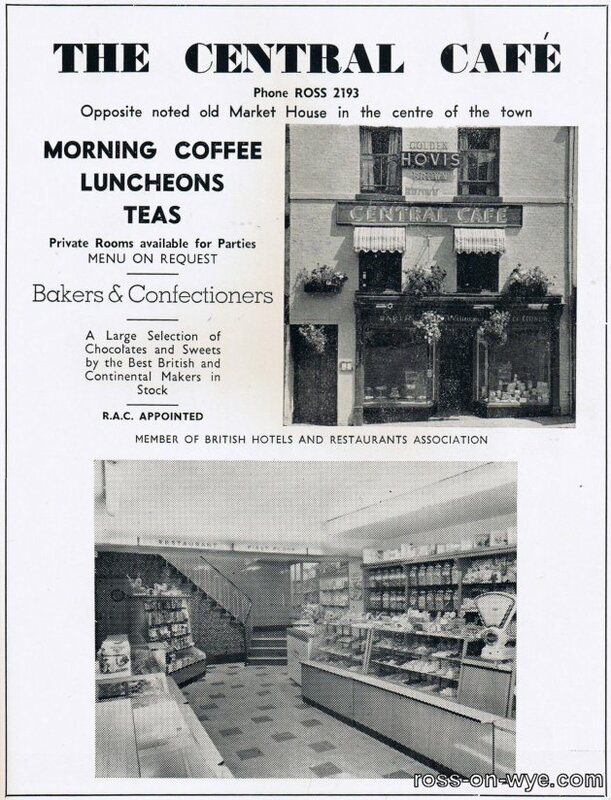 Most of the shops traded under the name of "Three Cooks" or "Sarah's Restaurants" and the Ross shop became a "Three Cooks". The Williams family retained the ownership of the shop, kitchen and bakery in Ross and leased it to RHM. Mr. Geoffrey Williams continued as chairman of Swansea Bakeries, a wholesale company he helped to form in 1985 and with 20 employees supplies bread and cakes over a wide area of South Wales. RHM then spent around £40,000 on refurbishing the Ross premises and further developing the take-away and catering side of the business whilst the shop continued to bake bread, rolls and buns and confectionery on the premises4. 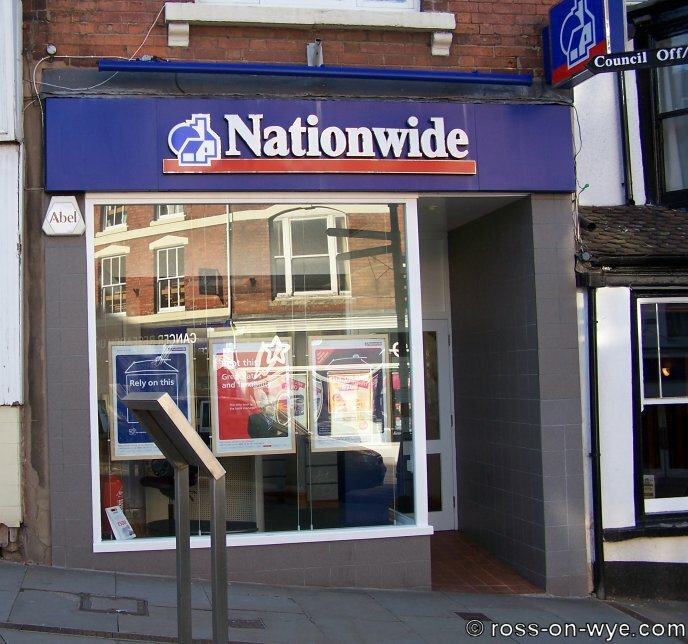 On the 1st November 2006, Three Cooks suddenly went into administration5 and all the shops closed without warning, which came as a shock to the staff. 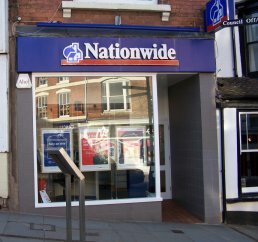 During 2007 and 2008 the shop was empty or let for short term lease such as to Neat n Cheap when they moved from Gloucester Road. Planning permission was granted to demolish the building and put a new retail unit and flats on the site and it was rumoured that M&S Simply Food were looking at potentially coming to Ross. Unfortunately they carried out one of their foot fall surveys on a particularly quiet day in the town and the economic downturn had started and they decided not to come to Ross. In January 2009 planning permission was requested to change the use and frontage of the site and following this, in August 2009, Costa Coffee opened their shop after substantial changes were made to open up the interior of the premises.